Data Processing: An Example – 36 Chambers – The Legendary Journeys: Execution to the max! This is part four of a series on launching a data science project. Last time around, I spent a lot of time talking about data acquisition, data cleansing, and basic data analysis. Today, we’re going to walk through a little bit of it with the data professional salary survey. The tidyverse package is a series of incredibly useful libraries in R, and I can’t think of doing a data science project in R without it. The XLConnectpackage lets me read an Excel workbook easily and grab the salary data without much hassle. The caret library provides some helpful tooling for working with data, including splitting out test versus training data, like we’ll do below. The recipes package will be useful for normalizing data later, and we will use data.table to get a glimpse at some of our uneven data. We need the devtools package to install keras from GitHub. Keras is a deep learning library which implements several neural network libraries, including TensorFlow, which we will use later in this series. We need to install TensorFlow on our machine. Because this is a small data set, and because I want this to run on machines without powerful GPUs, I am using the CPU-based version of TensorFlow. Performance should still be adequate for our purposes. Once we have the required packages loaded, we will then load the Excel workbook. I have verified the Excel worksheet and data region are correct, so we can grab the survey from the current directory and load it into salary_data. 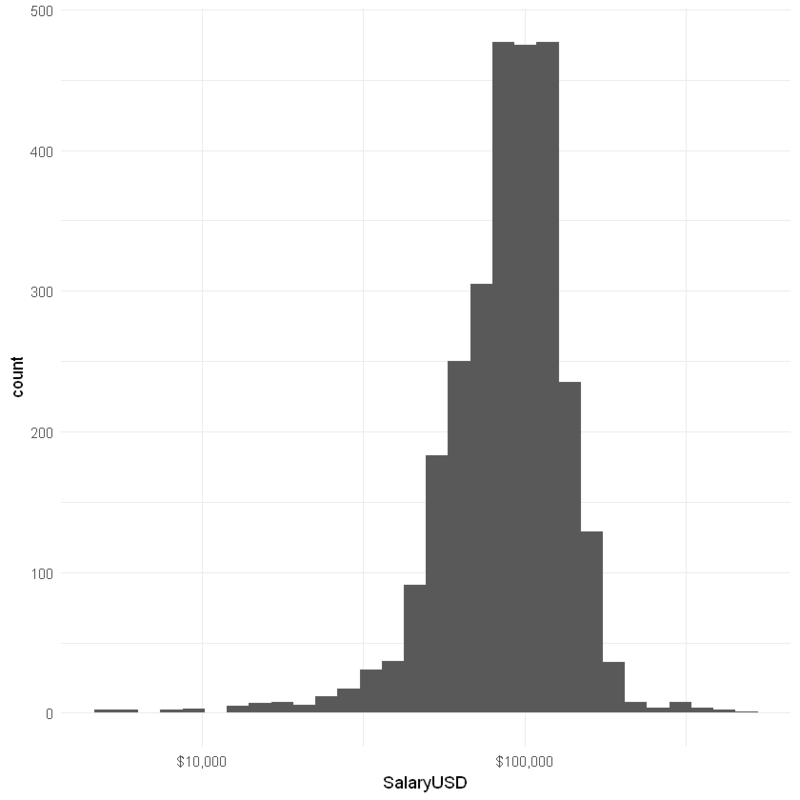 We can use the glimpse function inside the tidyverse to get a quick idea of what our salary_data dataframe looks like. In total, we have 6011 observations of 26 variables, but this covers two survey years: 2017 and 2018. Looking at the variable names, we can see that there are some which don’t matter very much (like Timestamp, which is when the user filled out the form; and Counter, which is just a 1 for each record. Our first data cleansing activity will be to filter our data to include just 2018 results, which gives us a sample size of 3,113 participants. There are also results for 2017, but they asked a different set of questions and we don’t want to complicate the analysis or strip out the new 2018 questions. For each of these variables, we want to see the range of options and perform any necessary cleanup. The first thing I’d look at is the cardinality of each variable, followed by a detailed anlaysis of the smaller ones. 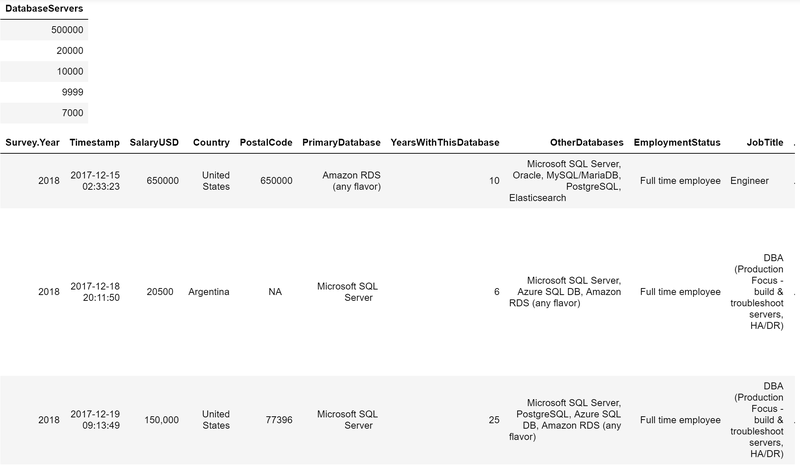 PrimaryDatabase is another variable which looks interesting, but it skews so heavily toward SQL Server that there’s more noise than signal to it. Because there are so many platforms with 10 or fewer entries and about 92% of entrants selected SQL Server, we’ll throw it out. We can use the setDT function on data.table to see just how many records we have for each level of a particular factor. 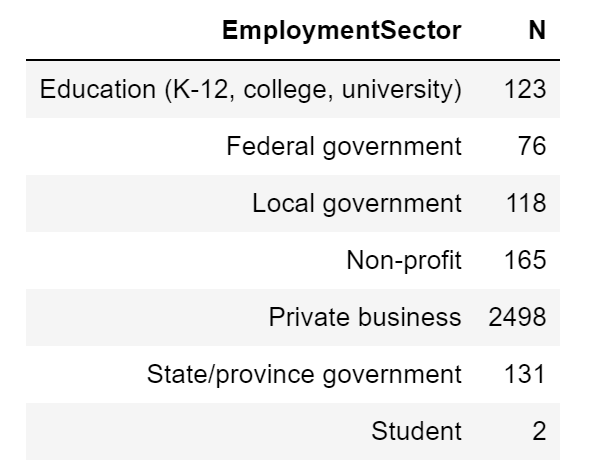 For example, we can see the different entries for PrimaryDatabase and EmploymentSector below. Both of these are troublesome for our modeling because they both have a number of levels with 1-2 entries. This makes it likely that we will fail to collect a relevant record in our training data set, and that will mess up our model later. To rectify this, I am going to remove PrimaryDatabase as a feature and remove the two students from our sample. To the three MongoDB users: you have my sympathy. In a way, aren’t we all students? No. Only two of us are. Some are older than they seem. 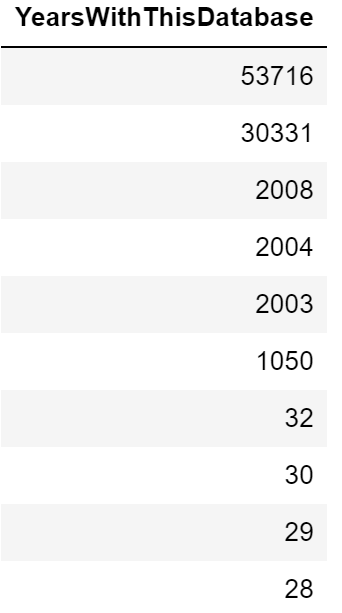 Someone with 53,716 years working with their primary database of choice? That’s commitment! You can also see a couple of people who clearly put in the year they started rather than the number of years working with it, and someone who maybe meant 10 years? But who knows, people type in weird stuff. Experience doesn’t pay after the first century or two. That’s pretty sad, considering their millennia of work experience. $95-98K isn’t even that great a number. Next up, we want to look at the number of database servers owned. 500,000+ database servers is a bit excessive. Frankly, I’m suspicious about any numbers greater than 5000, but because I can’t prove it otherwise, I’ll leave them be. 500K servers is a lot of servers. The first entry looks like bogus data: a $650K salary, a matching postal code, and 500K database servers, primarily in RDS? Nope, I don’t buy it. 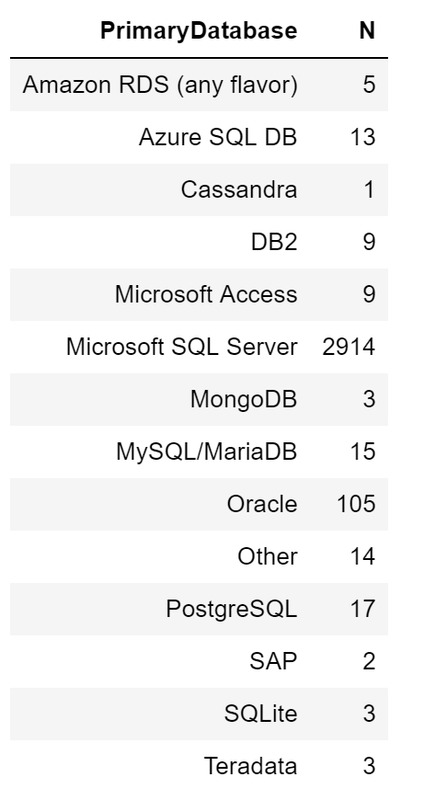 The rest don’t really look out of place, except that I think they put in the number of databases and not servers. For these entrants, I’ll change the number of servers to the median to avoid distorting things. 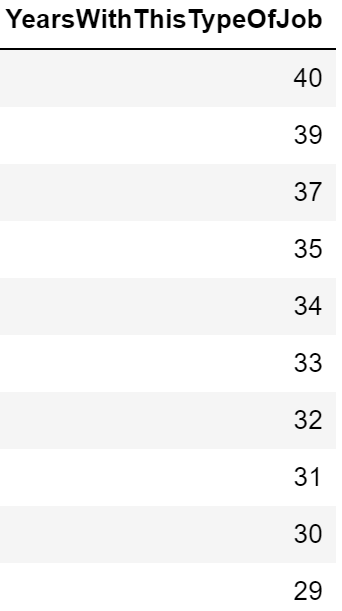 One of these numbers is not like the others. The rest of them are just bad. To the person who works 200 hours per week: find a new job. Your ability to pack more than 7*24 hours of work into 7 days is too good to waste on a job making just $120K per year. What would I do with an extra day and a half per week? Sleep approximately an extra day and a half per week. As far as Gender goes, there are only three with enough records to be significant: Male, Female, and Prefer not to say. We’ll take Male and Female and bundle the rest under “Other” to get a small but not entirely insignificant set there. 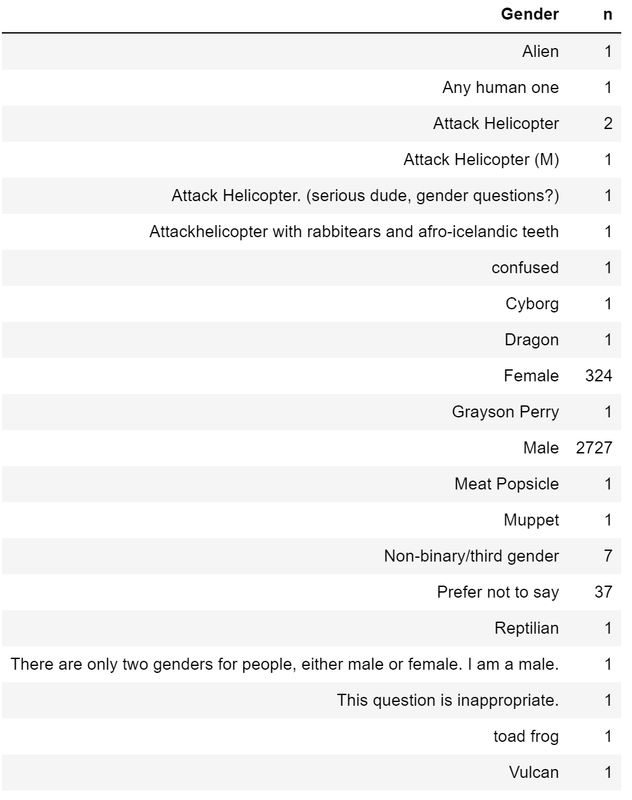 To the one Reptilian in the survey, I see you and I will join forces with Rowdy Roddy Piper to prevent you from taking over our government. Probably the most surprising country on this list is The Netherlands. India is a close second, but for the opposite reason. There are only fifteen countries with at least 20 data points and just eight with at least 30. This means that we won’t get a great amount of information from cross-country comparisons outside of the sample. Frankly, I might want to limit this to just the US, UK, Canada, and Australia, as the rest are marginal, but for this survey analysis, I’ll keep the other eleven. Some people put in pennies, which aren’t really that important at the level we’re discussing. I want to strip them out. Some people put in delimiters like commas or decimal points (which act as commas in countries like Germany). I want to strip them out, particularly because the decimal point might interfere with my analysis, turning 100.000 to $100 instead of $100K. Some people included the dollar sign, so remove that, as well as any spaces. It’s not a perfect regex, but it did seem to fix the problems in this data set at least. # There were only two students in the survey, so we will exclude them here. # Some people put in pennies. Let's remove anything with a decimal point and then two numbers. # Now any decimal points remaining are formatting characters. # Some people have entered bad values here, so set them to the median. # Some people apparently entered number of databases rather than number of servers. Now we can pare out variables we don’t need. Some of these, like postal code, are interesting but we just don’t have enough data for it to make sense. Others, like Kinds of Tasks Performed or Other Job Duties, have too many varieties for us to make much sense with a first pass. They might be interesting in a subsequent analysis, though. # One person had a salary of zero. That's just not right. Now that we have our salary data fixed, we can finally look at outliers. I’d consider a salary of $500K a year to be a bit weird for this field. It’s not impossible, but I am a little suspicious. I am very suspicious of the part-timer making $1.375 million, the federal employee making $1 million, or the New Zealander making $630K at a non-profit. 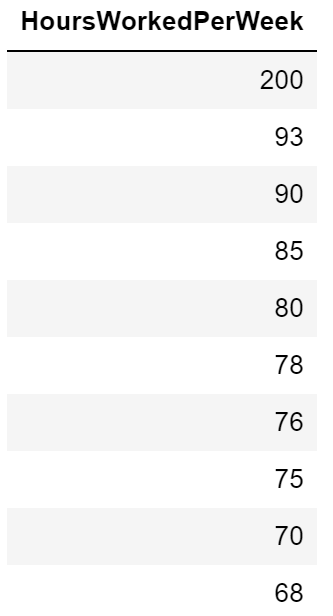 I’m kind of taking a risk by removing these, but they’re big enough outliers that they can have a real impact on our analysis if they’re bad data. I think I’d be willing to accept $1.4 million a year to be a manager of none. On the other side, there are 12 people who say they earned less than $5K a year. Those also seem wrong. Some of them look like dollars per hour, and maybe some are monthly salary. I’m going to strip those out. For just over a dollar a week, you can hire a data architect. We can also build a histogram pretty easily using the ggplot2 library. This shows the big clump of database professionals earning beween $70K and $115K per year. This salary distribution does skew right a bit, as you can see. Not including that guy making $58 a year. We can also break this down to look by primary job title, though I’ll limit to a couple of summaries instead of showing a full picture. This fit pretty well to my biases, although the max Data Scientist salary seems rather low. This is only a tiny sample of what I’d want to do with a real data set, but it gives you an idea of the kinds of things we look at and the kinds of things we need to fix before a data set becomes useful. In the next post, we will get started with the wide world of modeling. Pingback: How Much Can We Earn? Implementing A Model – 36 Chambers – The Legendary Journeys: Execution to the max!